One bowl Chocolate Cake recipe from scratch – as the name suggests is a chocolate cake that can be made in one bowl and then baked directly. An eggless chocolate cake without condensed milk, milk, butter or eggs; baking this moist eggless chocolate cake is as simple as counting 1 2 3.. Don’t believe me?? Then just read on to find more..
One Bowl Chocolate Cake.. so what is the fuss all about? 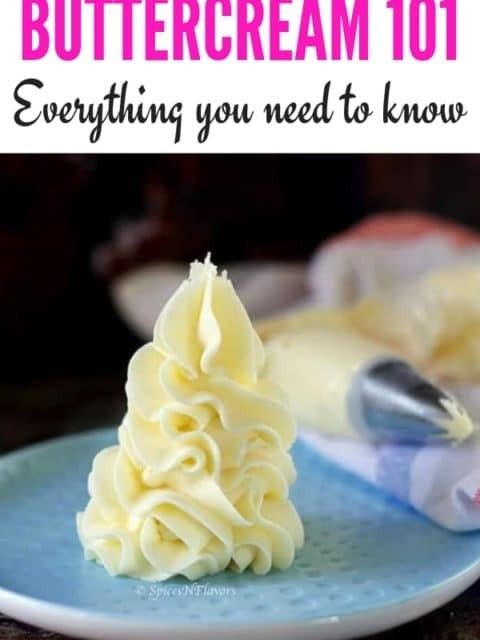 Well, we all think that baking a cake is hard and there are so many technicalities involved that we are often intimidated by it. So to break all those and to encourage everyone to bake; I thought of sharing this simple chocolate cake recipe with you all..
Or rather I should ask why is this a best simple chocolate cake? 1. That is because this One Bowl Chocolate Cake involves mixing the dry ingredients, adding wet and then just bake all in one single bowl. so simple right!!! 2. It also does not call for any exclusive ingredients. Probably you have all the ingredients required to make this homemade chocolate cake recipe in your pantry already. 4. And just to tell you this no egg no milk chocolate cake is also Vegan. Vegan Chocolate Cake in one bowl!! How cool is that? Undoubtedly the best chocolate cake recipe ever! 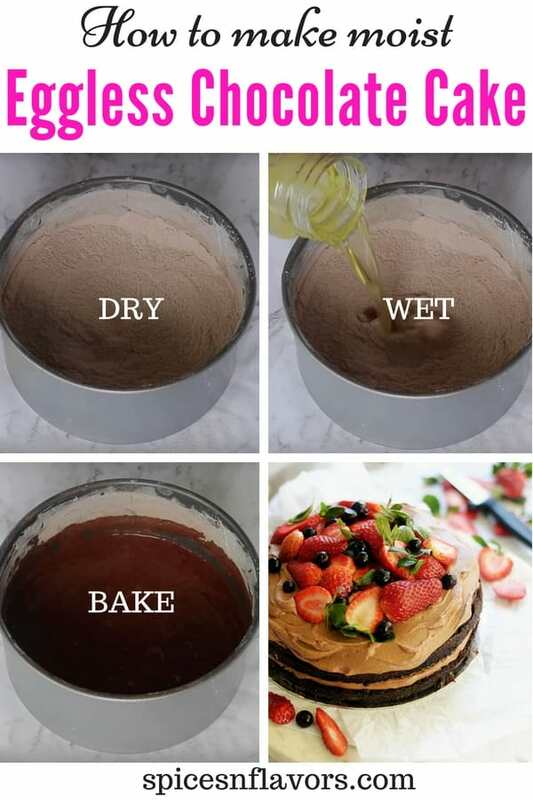 HOW DO YOU MAKE A MOIST CHOCOLATE CAKE? You might be thinking maybe its a moist eggless chocolate cake with yogurt or eggless chocolate cake with curd. And since its a vegan cake we are not using any milk products here. Then What makes the cake moist and fluffy? made using oil is much more moist and fluffy than the ones that is made with butter. B. The other thing that I would highly commend you guys if you include dairy products in your diet is to use milk in place of water as mentioned in the recipe which would make it even more moist. HOW DO YOU SUBSTITUTE EGGS IN A CAKE RECIPE? Why? Because leavaners and acids when combined under the heat of the oven react and produce gas (bubbles) that will make the cake fluffy. I hope this solved your query on how to make cake in oven without egg? 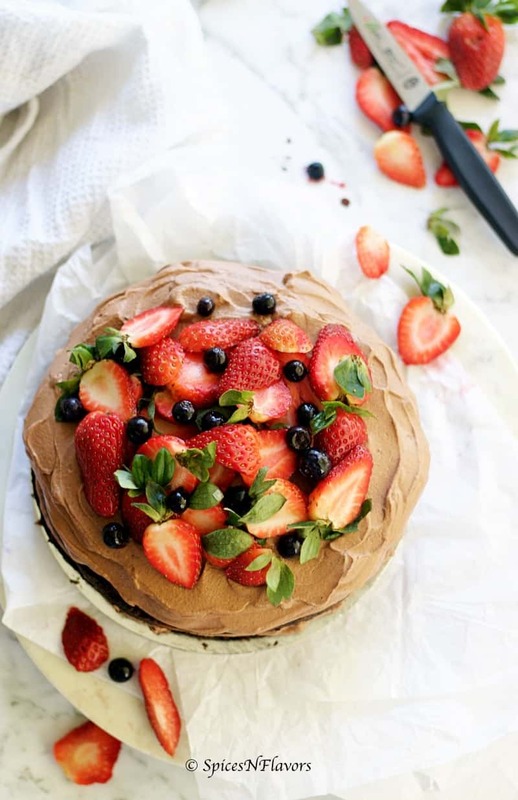 Can I make this One Bowl Chocolate Cake in cooker? Yes, definitely. I have made this cake in a cooker when I had been to India at my mom’s place since she do not have an oven yet. It took me nearly 60 mins to bake this though. How to mak this eggless chocolate cake in microwave? That I am not sure yet as I have not tried this in a microwave before. Coming to think of, this is the first ever actual cake recipe that I have shared on the blog. Being a baker myself, can’t think that this is my first. I have earlier shared simple cake recipe like my Rava Cake that is also eggless and in fact it doesn’t even have maida in it. And can be made in cooker, microwave or oven. But then its a tea time cake; you cannot classify it to a dessert. 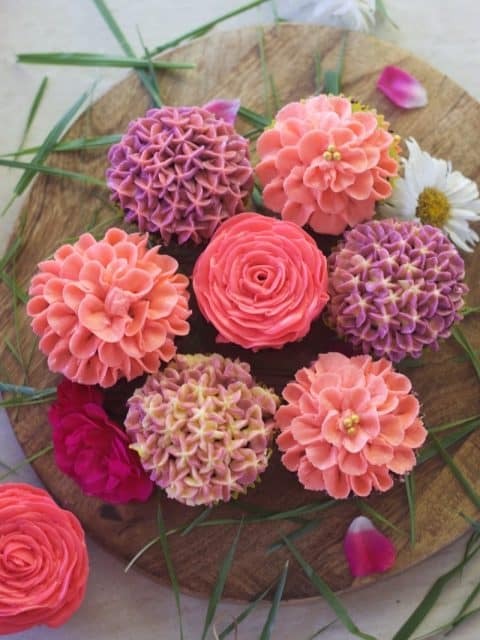 I have shared beginners baking recipes like chocolate muffins, scones or vanilla cupcakes but never a cake. I also have a variety of cookies recipe on the blog if you would like to check. 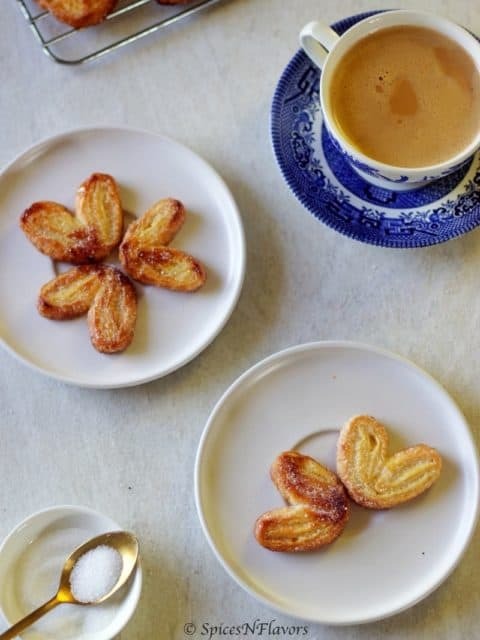 Now that I have thought of sharing a baking or dessert recipe every Saturday; you can definitely keep an eye here for more such recipes. Coming to the One bowl chocolate cake, let me tell you this is a super moist cake with oh so soft crumbs. 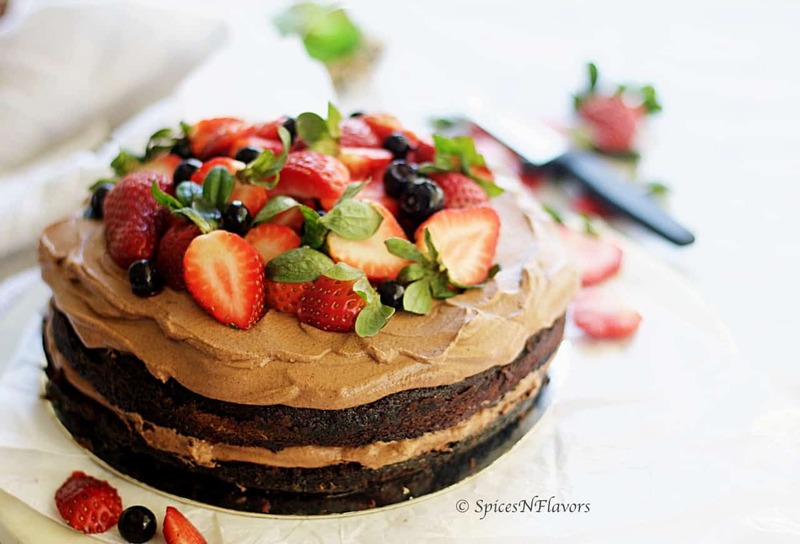 A soft and fluffy cake that is loaded with flavours of chocolate. The subtle smooth whipped cream adds to the moistness of the cake. Oh, by the way, this eggless chocolate cake recipe with icing is a keeper’s recipe. Not only is it easy to make the cake the whipped cream chocolate frosting is also super simple and to die for. All you need is 3 simple ingredients – cream, sugar and cocoa powder to make this frosting. However if you plan to frost this cake completely with whipped cream I would recommend making a stabilized whipped cream. You can read all about it here. The blueberries and strawberries brings in a freshness. If you like this simple one bowl chocolate cake recipe then do tag me, tweet me or instagram me. I would love to hear from you.. Whip your cake in the baking pan and bake directly; thats how simple this One bowl chocolate cake is. And the bonus point it has no eggs, no butter and no milk. Grease your baking tin and line the base with parchment paper. In the same pan sift your dry ingredients. Add sugar and mix everything well. Next add in the wet ingredients. Mix everything until you see no hint of flour. This would take about 30 seconds. Do not overmix. Bake in the pre-heated oven at 180°C for 30-32 mins. Do refer notes. Add all the ingredients mentioned for whipped cream in a bowl and whip to soft peaks. Divide the cake into two using a serrated knife in a see-saw motion. Apply sugar syrup onto it. Place half of the whipped cream on top of the base layer. Spread it out. Place a layer of blueberries in the centre. Layer the other half of the cake on top. Spread the remaining cream on top. Top it off with the remaining cream and garnish with strawberries and blueberries. Highly recommend you to watch my video on youtube for easy understanding. Refer notes for the same. 2. You can enjoy the cake as it is, the whipped cream and fruits is an optional step but it adds moistness to the cake. 3. Do not over-mix the batter. 4. Do not bake for more than 32 or 33 minutes; I made the mistake of baking it for 35 mins and I thought it was over-baked just a bit. Let it bake for 30 mins and then check with the toothpick. If you think it is not baked then bake it for just 2 mins more and I am sure you would have a lovely cake. 5. Use coconut cream to make this completely vegan. 6. The sugar syrup has to be cold while you are applying it to the base. You can also use vinegar in place of lemon juice and yes this is an eggless chocolate cake with vinegar; but do not raise an eyebrow like I have mentioned above you need the acidity to react with the leaveners for a light and fluffy cake. 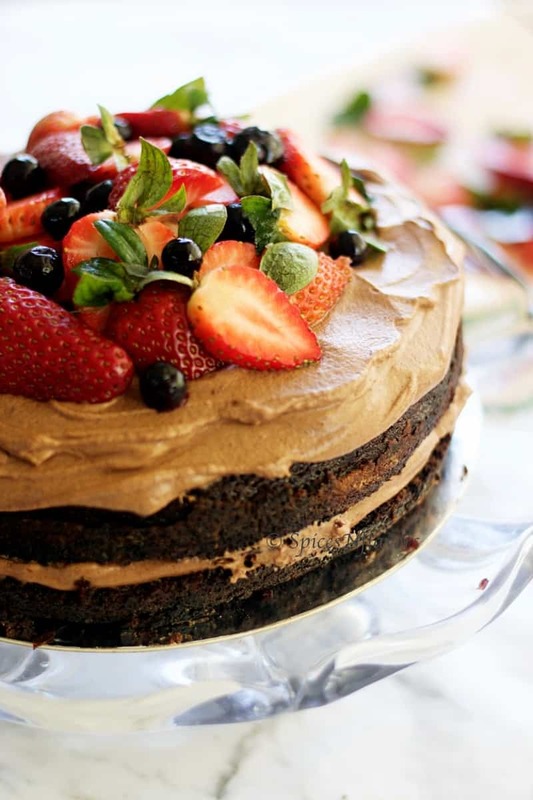 I hope you enjoyed this easy moist chocolate cake recipe. Cake looks awesome..interesting part is that it needs just a bowl to get it ready.. Exactly Lathiya.. in my opinion that is the best part actually.. hehe..
That is such beautiful looking cake. Cant imagine it is made out of such simple recipe,which brand of whipping cream do you use ? Thank you so much dear.. Coming from someone like you I am cloud 9 today. Its so tempting. I have one question how to adjust time for baking cake.mostly in recipes specific measurements of pan is given but if we want to make in one big pan instead of two small.how should we calculate the time. It is basically trial and error only.. So for a 10 inch cake this recipe bakes in 17 mins.. I know this because I have baked this like a hundred times now.. depends on what size you are after.. Seems intimidating but with practise you get an idea of it 🙂 There is no specific hard and fast rule here that I can share with you depends on oven, and the cake pan. 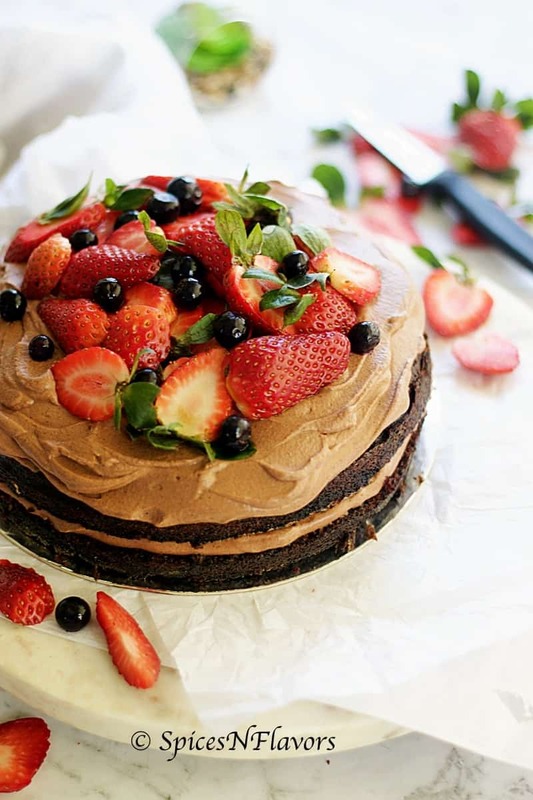 Love the way you combined chocolate with strawberries. Very easy and nice. 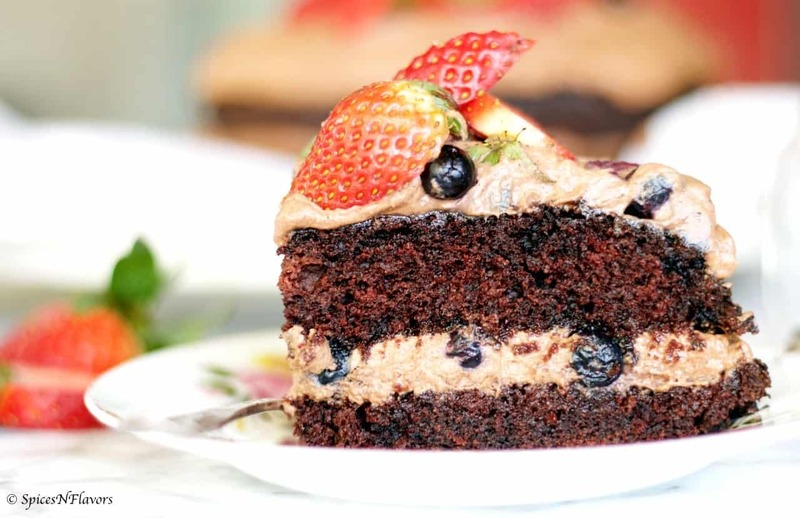 Yes dear one bowl cake recipes are so simple and the best part is no extra dishes.. phew.. This looks perfectly bakes, moist and spongy. yum yum. I like how you have decorated the cake. Absolutely stunning! Such a yummy cake. 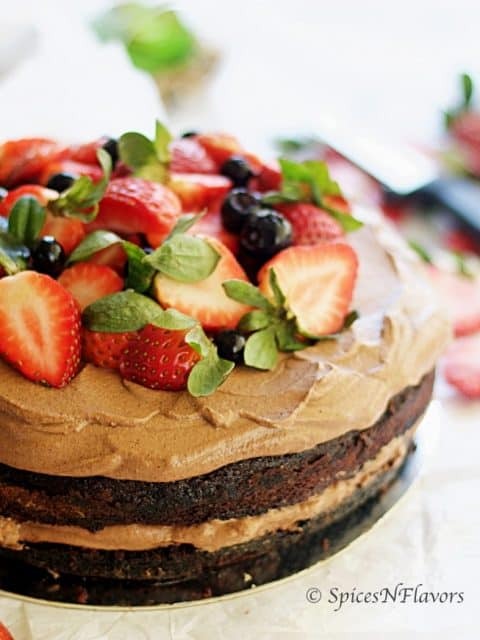 I know most people would go for this cake because it is a chocolate cake…but for me, it is the whipped cream!!!! can’t get enough of it!!! Gimme a high five!! exactly my thoughts..
Can we try this with sooji flour that too in a cooker ? And i wanted to use carob powder instead of cocoa.What quantity of carob powder should be taken ? The cake was yummy. My family loved it. Why does the cake turn out super soft that it breaks very easily ? Its very difficult to cut out a layer and separate it for applying sugar base and cream. I want to make plain whipped cream without cocoa powder.How much quantity sugar should I reduce ? Thank you for this recipe. The outcome is perfect. All liked it very much. Is it OK if I don’t use lemon juice?